Wearing one’s heart on one’s sleeve and jacket front. 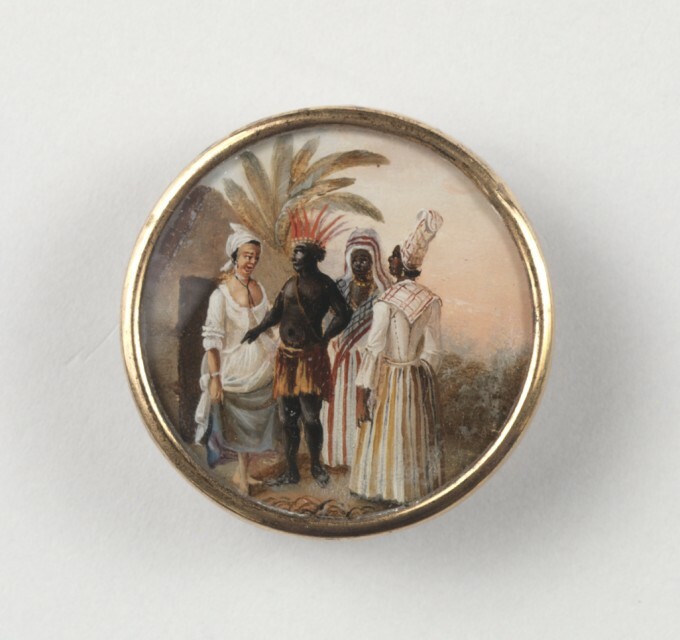 A set of eighteen remarkable buttons each feature a small painting of groups of people of mixed races in a British West Indies island, then called Dominica, now Haiti and Santo Domingo. The artist, subjects and traditional history all collide to make the buttons an extraordinary combination of artistic significance, social history, and inventive design use. Look at all the details the artist included on this very small surface! Think of the idea that someone would choose to wear paintings as buttons. That idea might make sense if the stated history is true that these belonged to Toussaint l’Ouverture, the former slave who became ruler of Haiti and adorned the jacket he took with him when exiled to France after his capture. They would have been his treasured pictures of the island. Each button has a different scene-a variety of well-dressed mixed race and black women, African servants, and a few whites, all set in tropical landscapes with palms and thatched houses. Brunias’s full scale paintings have similar scenes; some traveled to London, commissions for Royal Academy exhibitions, others were for rich sugar plantation owners. These owners were not always white; black and mixed race owners’ families are shown wearing the hats and clothing of status: European dress for the wealthy; various amounts of textile patterns establish the roles of other figures. The people depicted in the buttons are mostly black. Their clothing runs the full range from the wealthy European style to the simplest. Some scenes on the buttons match engravings by Brunias, so a few researchers have thought that the buttons were painted from the prints by someone else. But close attention to the style suggests Brunias’s hand, so perhaps he created designs from which he did both buttons and prints. I wonder if Brunias’s interest in the multi-racial culture with blacks as part of a society with fashion might have made him subtly sympathetic to Toussaint l’Ouverture. The history that accompanied these buttons connecting them to Toussaint makes sense. However, it lacks documentation for a few generations before they came up at auction in the 1930s, when the descendants of the boy to whom Toussaint is said to have given the jacket conveyed the history through the auctioneer to a French dealer who purchased the buttons for Mrs. Robert Noyes. She lent them to Cooper-Hewitt, where they later entered the Collection. They were detailed enough for them to provide design inspiration for a New York Theater Guild 1942 production of the play “The Pirate” with Lunt and Fontaine. I would love to see photos of that! These are a great example of the elaborate buttons that were special made for individuals with enough money to purchase them. What a treasure and a real treat to get to see them. I learned about buttons at the museum in the book “The Button Collector’s Second Journal by Lillian Smith Albert, published in 1941, I just purchased it and was trilled find a link to your site, and to find these buttons there. Where can this button set be seen, and will it ever be for sale? 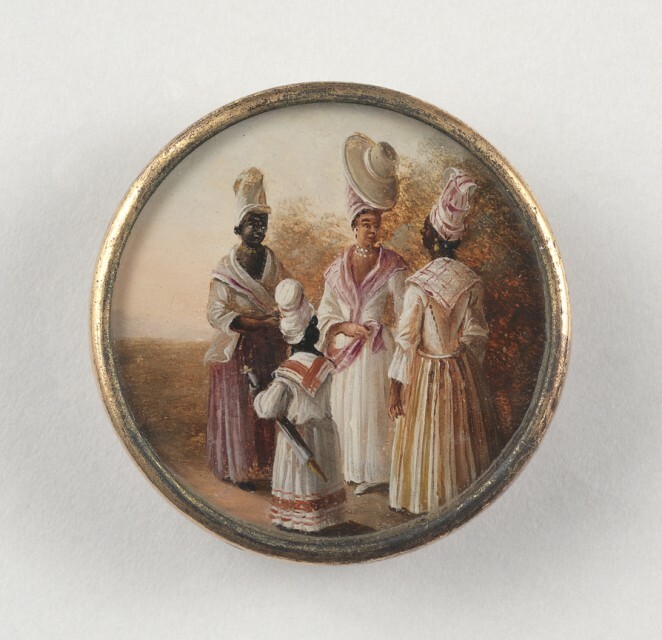 Set of Eighteen Buttons with West Indian Scenes, c. 1795. Artist: Agostino Brunias, Italian active in England and Haiti 1730-1796, Dominica (Current Haiti/Santo Domingo). Gift of R. Keith Kane from the Estate of Mrs. Robert B. Noyes. 1949-94-1/18.